Our research program is devoted to the study of "Mitochondrial Biogenesis and Turnover in Health and Disease". We are particularly focused on mitochondria in mammalian skeletal and cardiac muscles. A number of in vivo experimental models are used to manipulate the rate and extent of mitochondrial turnover in these tissues. In skeletal muscle these include 1) chronic exercise, brought about running, or by electrical stimulation in vivo and in cell culture, 2) muscle disuse, usually produced by denervation, and 3) aging. We also investigate the effects of thyroid hormone on mitochondria in both muscle and heart. Physiological, biochemical and molecular biology techniques are employed to study mitochondrial biogenesis in these tissues. Muscle contractile activity induces multiple signaling events and the translocation of several proteins to different parts of the cell. This figure details the major signaling and translocational events which control mitochondrial health and turnover. A major focus of our work continues to be on the transcriptional and post-transcriptional regulation of nuclear-encoded genes that regulate mitochondrial turnover. Four of the most important proteins which control mitochondrial biogenesis include PGC-1α, mitochondrial transcription factor A (Tfam), Transcription factor EB (Tfeb) and p53. We are investigating the function of these proteins using muscle-specific or whole body knockout animals. At the transcriptional level, we study the promoter regions of these genes transfected into muscle in vivo, or into contracting or non-contracting muscle cells. At the post-transcriptional level, we are examining the role that contractile activity plays in regulating mRNA stability, and in affecting the import of proteins from the cytosol into the mitochondria. We are also interested in how exercise, aging and disuse affect mitochondrial morphology and the proteins that control organelle movement. To do this we use electron and fluorescent microscopy techniques, as well as immunoblotting of important components of the fission and fusion pathways. We also investigate the effects of age and exercise on the assembly of multi-subunit protein complexes using blue-native gel electrophoresis. In addition, we are interested in the very early signals induced by exercise which provoke the initial steps involved in mitochondrial turnover. Thus, we study the activation of signaling kinases and the expression of genes which are induced by acute exercise in animal models of contractile activity. 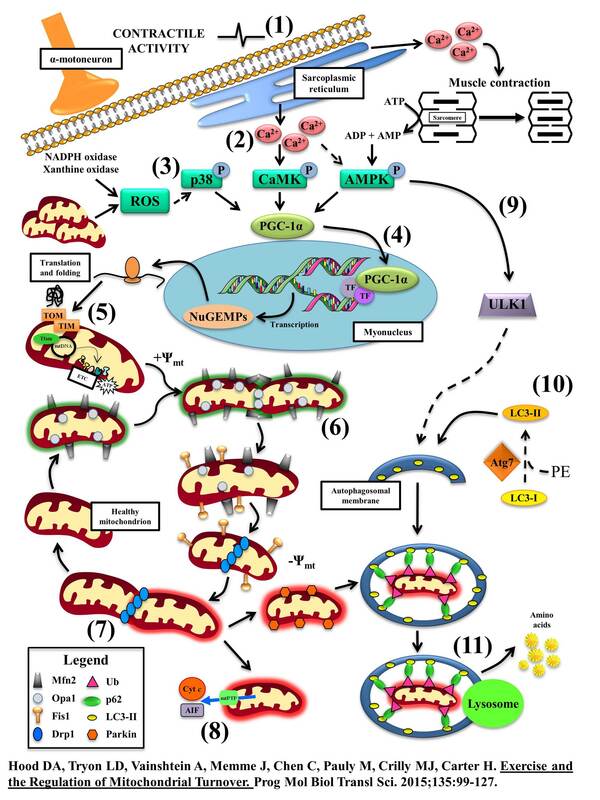 In addition, a major emphasis of our work is now devoted to understanding mitochondrial degradation via the autophagy pathway (i.e. mitophagy), as provoked by exercise or muscle disuse. 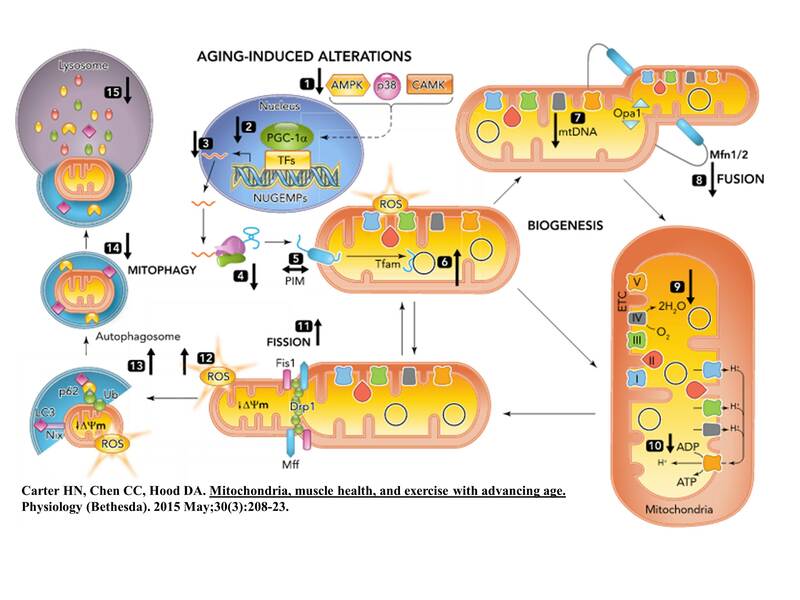 Aging induces a variety of changes to mitochondrial composition and function, and is associated with alterations in signaling pathways which regulate mitochondrial turnover. Most of our research makes use of animal models or cell culture techniques. However, we have active collaborations with scientists at other universities which help us obtain human muscle samples from healthy or diseased patients for the investigation of mitochondria. In addition, in collaboration with other members of the Muscle Health Research Centre (MHRC), we can acquire human muscle samples using the muscle biopsy technique. In addition to the description provided above, each of my students has briefly described their individual projects in the "Lab Members" section of this website. The information that emerges from our research will help us to understand the regulation of mitochondrial turnover in muscle subject to physiological conditions (e.g. exercise, disuse, aging, hormones). From a practical standpoint, this work informs us about how exercise can improve muscle performance, prevent disease and improve our quality of life. From a clinical perspective, our research provides us with a better understanding of the molecular basis of skeletal muscle and cardiac mitochondrial myopathies, and the aging process. Our research is funded by NSERC (Mitochondrial Biogenesis is Skeletal Muscle), CIHR (1: Mitochondria in Aging Muscle; 2: Autophagy in Muscle) and the Canada Research Chairs Program. We have >2000 square feet of space that includes major sections devoted to cell culture, animal surgery, radioactive experiments, biochemical and physiological research. Included in our equipment is a 4-colour flow cytometer, a fluorescence microplate reader, a UV/visible spectrometer, incubators, a cryotome, both upright and inverted fluorescent microscopes, ultra- and high speed centrifuges, real-time PCR equipment and various items to help facilitate our work. We also have 8 computer stations for data analyses. We are members of both the Canadian Society for Exercise Physiology (CSEP), the American Physiological Society (APS) and the American College of Sports Medicine (ACSM). We regularly attend and present papers at the annual meetings of these societies.